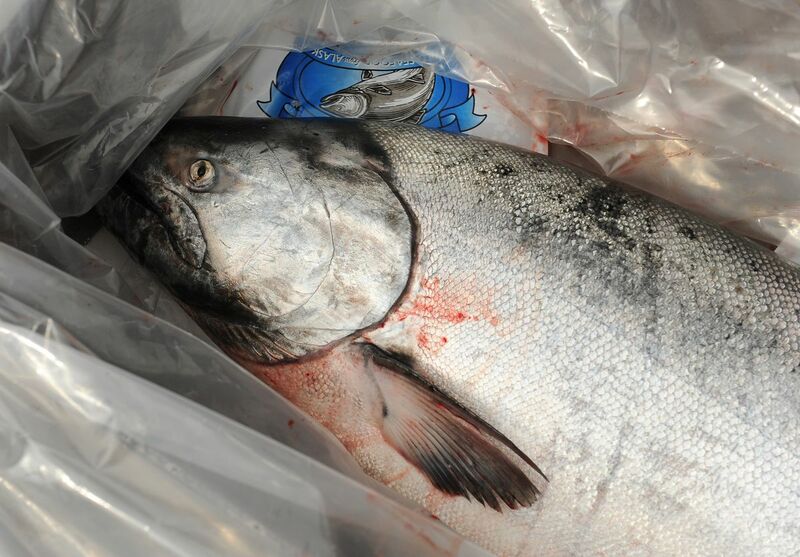 The first Copper River salmon of the year are fetching a hefty price on some market shelves in Alaska and Outside, thanks in part to what's expected to be a weak run of the prized fish. At Seattle's Pike Place Fish Market, which draws tourists in droves to watch its famed fish-tossers, fillets of Copper River kings sold for $75 per pound this week. Jason Scott, a manager at the Pike Place Fish Market, said that whopping price tag on a king fillet is a little higher than it was last year, when it was around $60 to $70 per pound. That number drops as the season goes on and more salmon flow into the market. "Everything is crazy," he said. "All of our orders are people who have been buying fish from us for a long time. They don't bat an eye at the price. I'm not saying we know that and take advantage of it, but each of us has a customer here who wants the biggest one." Fishermen caught about 93,000 Copper River salmon during the first two days of fishing this year, according to preliminary numbers from the Alaska Department of Fish and Game. That broke down into about 88,000 sockeyes, 4,000 kings and 1,000 chums. "I can say based on my conversations with others in the industry it appears that the prices paid to fishermen on the first opener were record high prices," said Cassandra Squibb, chief marketing officer for Anchorage-based Copper River Seafoods, in an email. She said the prices she's heard in the past week ranged between $6 and $8 per pound for sockeyes and between $9 and $12 for kings, plus extra for dock deliveries and handling. Those prices, she noted, don't take into account incentives offered by processors that are factored in at the season's end. "I think it's safe to say the prices for fish off the first opener are being sold for higher than average," she said. When it comes to how much people will pay for the fish at a retail price, "it's one of those 'money is no object' type things," said Andy Wink, a seafood economist with Anchorage consulting firm the McDowell Group. The supply is so limited, he said, that the price can vary hugely day by day in different markets. Copper River sockeye was selling for $30 per pound on Tuesday at Fred Meyer in Midtown Anchorage, and $33 per pound at the New Sagaya Midtown Market. At 10th & M Seafoods, king fillets were priced at $50 per pound and sockeye fillets were selling by the pound for $32. "The price for the first couple openers is always high," said Rob Winfree, vice president at 10th & M. "There's very little harvest in the first couple periods, and the demand is huge." Fish and Game's commercial harvest projection for Copper River salmon this year calls for 4,000 king salmon, 207,000 cohos and 889,000 sockeyes. For the 2016 season, the state predicted a catch of 21,000 kings, 201,000 cohos and 1.62 million sockeye — but commercial fishermen actually caught 13,100 kings, 369,000 cohos, and about 1.2 million sockeyes. Christa Hoover, executive director of the Copper River/Prince William Sound Marketing Association, expects the high retail prices to soften. "Every year we see these leading high prices for Copper River salmon because just the excitement builds this time of year for salmon in general," she said. "These are splashy big prices right now, but this isn't the price consumers pay all summer long." This story originally incorrectly stated that fishermen caught 93,000 Copper River salmon in last week's opener on Thursday. Fishermen actually caught those fish over two days of fishing, on Thursday and Monday.